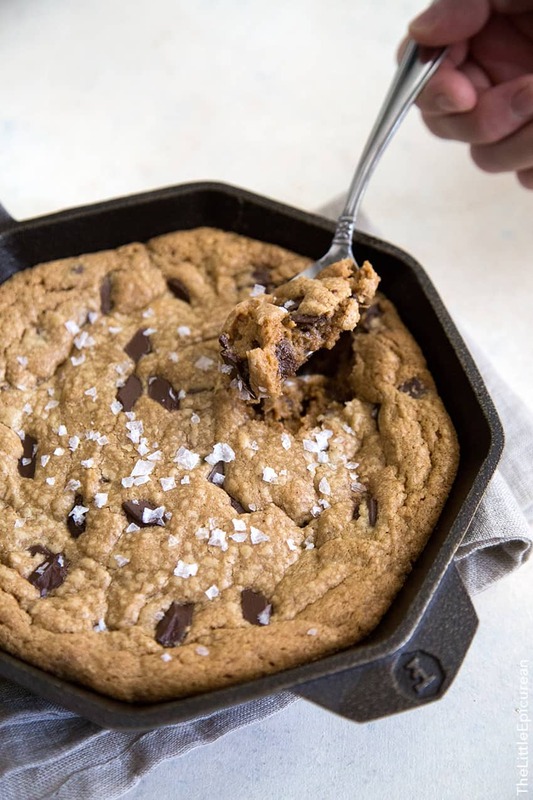 A skillet cookie is the perfect way to celebrate victories big and small. Made with brown butter, peanut butter, and dark chocolate, this is a rich and delicious dessert that’s easy to make any day of the week! I don’t make cookies very often. They’re dangerous around me. Cookies are portable little snacks that mindlessly make their way to my stomach. They’re far too easy to eat. Today, I’m going to make cookie eating a little difficult. This cookie requires the use of a spoon. We’re eating cookies because a celebration is in order! This skillet cookie really hit the spot. After 8 weeks of tucks and holds and shaky legs, the combination of nutty brown butter, smooth peanut butter, and melted dark chocolate was exactly what I’ve been craving. 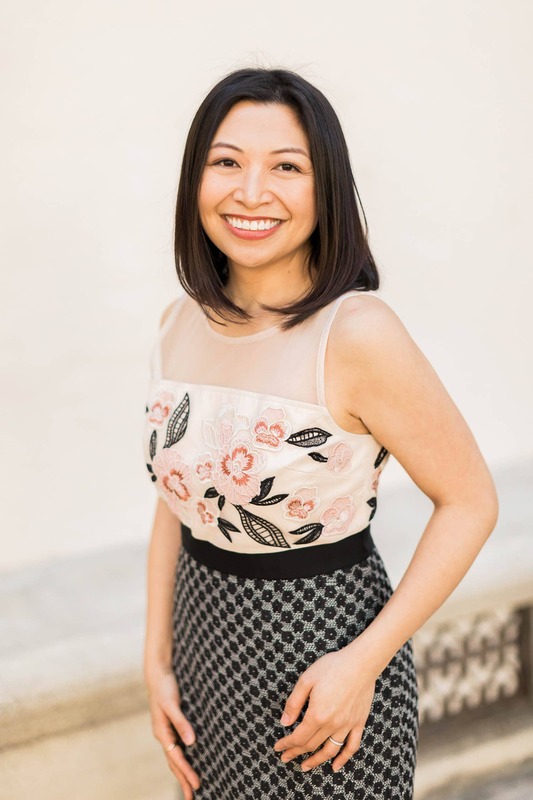 While I hope to continue taking barre classes (although I’ll probably cut it to 3-4 times a week), it’s time to focus on our upcoming wedding! It’s less than THREE MONTHS away. We’ve been planning for over a year. I’m ready to seal the deal and PARTY with our favorite people. In an 8-inch cast iron skillet (or oven safe skillet), melt butter over medium heat. Once butter has melted, continue to cook. Swirl pan occasionally. Mixture will bubble and foam as it cooks. Continue to cook until butter smells fragrant and nutty. The milk solids in the butter will turn a rich brown color. Remove from heat and pour into a mixing bowl. Allow brown butter to cool for 10 minutes. Do not wash skillet. Set aside for later use. Add brown sugar and granulated sugar to brown butter. Mix until sugars are moistened. Add egg and vanilla. Mix until incorporated. Add peanut butter and mix until incorporated. Whisk together flour, salt, baking soda, baking powder, and optional espresso powder. Add dry ingredients to wet ingredients. Use a sturdy spatula to fold together. Add chocolate chunks and fold until distributed among dough. 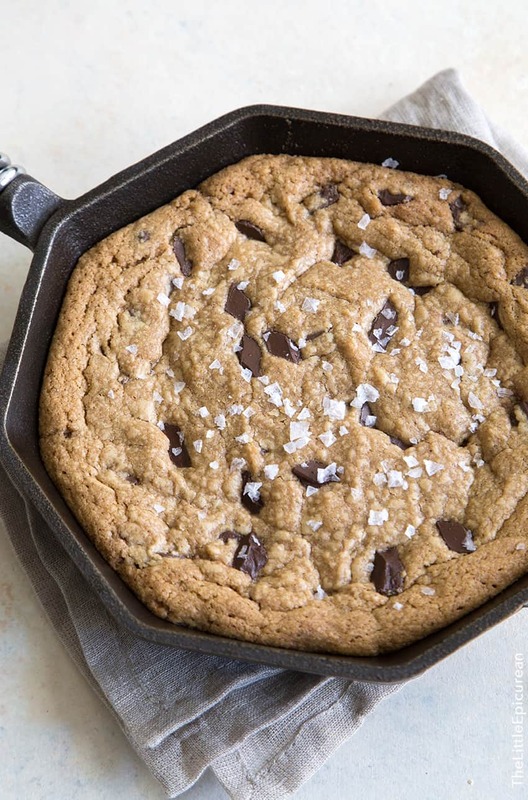 Transfer cookie dough to used 8-inch skillet. Press cooke dough along sides of the pan, ensuring an even layer of dough in the pan. Bake for 10-13 minutes until the edges of the cookie have set and are golden brown, while the center of the cookie is still slightly soft. Allow to cool for a few minutes. Sprinkle sea salt flakes, if desired. Serve and enjoy warm. Oh my gosh, I don’t think I could ever do 40 classes in 60 days! 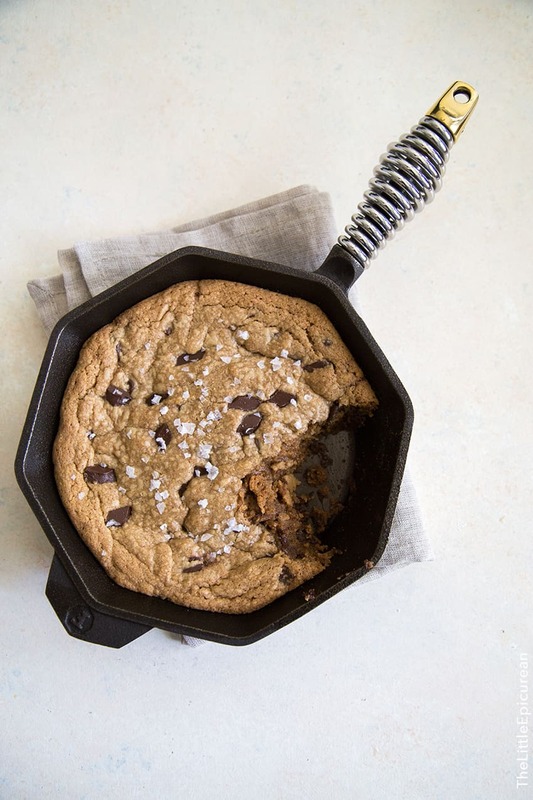 You definitely deserve this skillet cookie! If I get a cookie this delicious as a reward, I can certainly try a few barre classes at the very least! I love skillet cookies! This looks wonderful! I have got to make this cookie!! YUMMY!! Ahhhh, that looks perfect, I WANT!!! 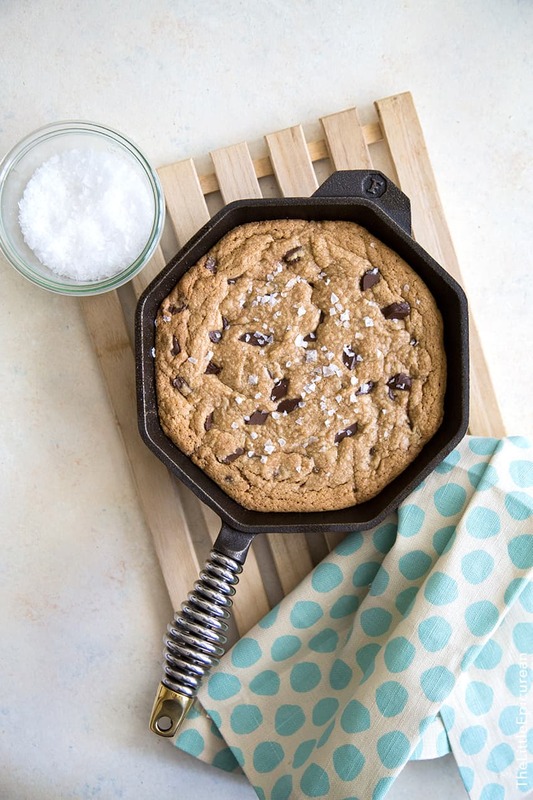 This skillet cookie is seriously calling my name! Love all that chocolate chunk goodness! This is like heaven in a skillet! YUM! I can’t think of a better reward for all of your barre-ness! Followed the recipe exactly, and after the recommended 10-13 min the cookie was still completely liquid – ended up needing 30 min in the oven!